Journey to the depths of the Triangle! Bermuda is surrounded by the world’s most Northern living coral reef, resulting in over 350 wreck sites surrounding our little island. Most of these wrecks are situated in relatively shallow depths of 30-50ft., allowing for extended bottom times and short boat trips. These factors have contributed to Bermuda consistently being voted one of the World’s Premier Wreck Diving Sites. All your equipment will be supplied at our PADI 5 Star Dive Shop, so all you need to bring is a bathing suit and a towel. Divers will be extensively briefed on the short boat ride to our first dive site, usually a historic wreck in 50- 80ft of water. Another short boat ride takes us to our second dive site, a breathtaking reef where coral and colorful fish are abundant. Our certified instructors will guide you throughout each dive, ensuring safety and identifying the unique inhabitants of the area. A relaxing cruise back to land completes the perfect Bermuda Dive. *Participants must be certified divers with proof of certification. 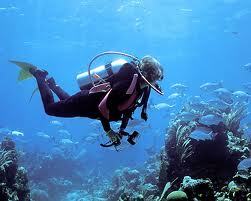 Age and health restrictions apply and vary by nature of dive excursion. A signed waiver and medical form is required. Excludes: Towels or gratuities for the crew. Additional equipment for rent. Taxi ride will be required to reach the dock, tour should be booked when arriving at Hamilton or Kings Wharf.